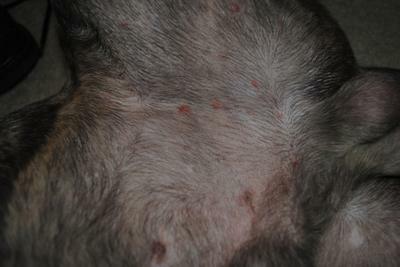 My dog has developed several red bumps on his groin area (and one on his chest) in the last couple of days. They look a lot like pimples, or insect bites, but I am not sure. He is an 8 month old Pitbull terrier. Any information on what this is and how to get rid of it would be most appreciated. 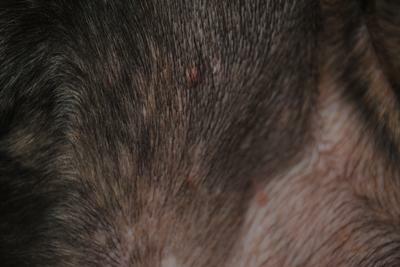 This is a common type of superficial skin infection that affects young dogs. The good news is that puppy pyoderma usually resolves over the course of a week or two if you clean the area twice a day with a topical antiseptic like chlorhexidine. More severe cases may require treatment with topical or oral antibiotics. Most puppies outgrow the problem given enough time. If your dog’s condition worsens or fails to improve in the next week or two, make an appointment with your veterinarian. Join in and write your own page! It's easy to do. How? Simply click here to return to Skin Pimples.